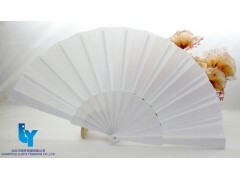 This sfabric fan is strong and durable for daily use, and it’s also a beautiful gifts witch many customer send to their business companion or use as exhibition. It is made from silk blend fabric with real bamboo spines and handle. When folded it's compact and portable, and easily tucks away in a purse or bag.